Link building is an important part of a SEO campaign and marketers need to continuously track the campaigns’ performance in order to optimize them. One way of measuring the link building performance is through keywords performance analysis in terms of rankings, traffic and conversions. Another way is through link building dashboards. I am going to set up powerful and actionable link building performance dashboards for you. But before we dive deep, let us get on the same page about the value of links. What is the commercial value of a back link? A link which generates traffic and conversions is a high value link and the link which doesn’t is a low-value link. Once a link has generated traffic and conversions, it has served its commercial purpose. I like keeping things simple. The main reason for not reporting these metrics is that they don’t align with business objectives and we are committed to reporting something which is ‘business bottomline impacting’. The other but personal reason is that I don’t want to look stupid by talking about partial/exact match anchor texts or followed/no followed links in front of my clients. Honestly who cares about such vanity metrics in the business world. However feel free to use these metrics for internal reporting/ work. I know we all know it. But you need to start treating back link as ‘referrer domain’ loudly and openly and not just sub-consciously. This will help you in evaluating the value of a link. For example, let us suppose your blog got a back link from the moz.com website. Now how you will evaluate the commercial value of this link? Go to Referrals report (under Acquisition > All Traffic in Google Analytics) and then determine the traffic and conversions generated by the domain from which you got the back link. Soon you will realize that not all back links are referrer domains and that is perfectly normal. They never sent any traffic to your site, so Google Analytics never recorded them. Often such links are from free and paid directories, article submissions sites, low quality guest posts, link networks etc. We don’t need to talk about such links in external reporting. At best they can be reported as raw number of links built (if you still insist). So if we are doing high quality link building then the number of referrer domains must increase every month and there should be traffic and conversions through these domains. Referral traffic analysis is the best way to evaluate the performance of links acquired through a marketing campaign. But before we start our analysis, we need to keep in mind that not all referral traffic is because of link building efforts esp. if your client is doing multi channel marketing. Your website may also get referral traffic because of PPC campaigns, Affiliates or other personal web properties. 1. All the other websites which are owned by the client. There can be hundreds of such sites if your client is very big. 2. All the affiliate websites. The traffic from affiliate websites can be treated as referral traffic by Google Analytics. 3. All Adwords placement domains. When you run Display ads via Google Adwords, you get traffic from websites which is also treated as referral traffic by Google analytics. For example, if you are running display ads on youtube.com and you are getting traffic. Then youtube.com will be treated as referrer domain by Google analytics. 4. All the referrer domains which are built by other marketing agency or some other campaigns. I create and apply advanced segments to exclude all such domains from my referral traffic report in Google Analytics while evaluating the performance of link building campaigns. 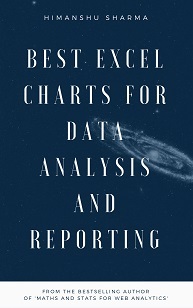 Once I have applied the advanced segments, I download the data and create the following dashboards in Excel. You can get the number of referrer domains through Google Analytics ‘Referral’ report. Through ‘Referral Visits vs. 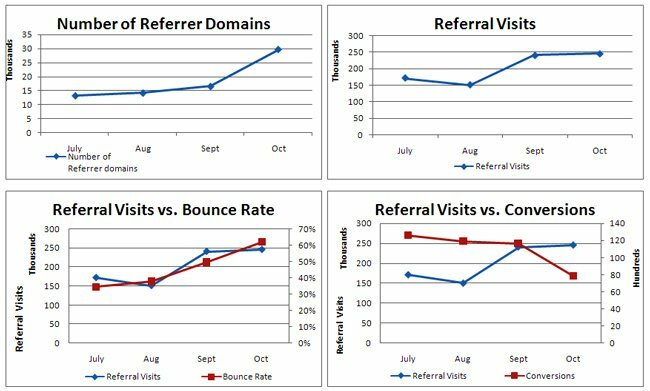 Bounce Rate’ chart I am determining the quality of the referral traffic. 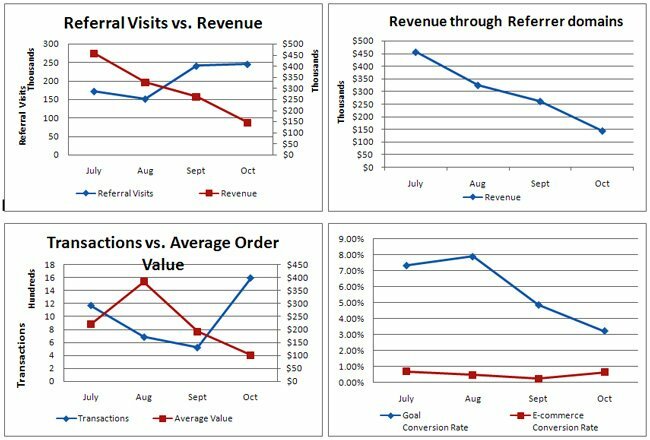 The ‘Referral Visits vs. Conversions’ and ‘Referral Visits vs. Revenue’ charts give additional insight into the quality of the referral traffic. If visitors through referrer domains are engaging with my site content then bounce rate is going to be lower. But what if this engagement is for all the wrong reasons? For example, if visitors are engaging with my website for all the wrong reasons then how can I be sure of this. I can determine this through ‘Referral Visits vs. Conversions’ and ‘Referral Visits vs. Revenue’ charts. If user engagement is not distraction and is truly profitable for your business then the referral traffic should convert. From the charts above we can see that though the referral traffic is increasing month after month the revenue and conversions through referrer domains is still going down. This means we have got a work to do. We need to determine what is going wrong on our website and why referral traffic is not converting well. May be we are targeting wrong linking partners. The ‘Transactions vs. Average Order Value’ chart gives further insight into why the revenue through referral traffic is going down. The main problem seems to be ‘average order value’ which has been going down since August. What could be the reason of low value orders placed on the website? We need to determine this. These are the examples of some of the things you can do with the link building dashboards.